Studies continue to show that family meals lead to fewer mental and physical health problems, fewer behavioral problems and greater academic success for our children. Jack Petrash has shown in his research that many studies show that family meals contribute to healthy teens on every level. More than any other factor he discovered in happy, high self esteem children, was that they ate regular meals with their families. The University of Minnesota researchers also found adolescents who ate with their families regularly did better in school and were less likely to use alcohol and drugs. These adolescents were also less likely to have symptoms of depression and physical problems. Those who did not eat with their families suffered from depression, low self esteem and suicidal thoughts. It’s August and school is about to kick off again. Throw a blanket on the grass in the back yard or pull together an outdoor picnic on the patio table. Prior to feasting, collaborate with your kids to come up with dishes (and desserts) for dinner. Throw your veggies on the grill, or getting ingredients together to bake cookies and other goodies. Get hands on with them in their cooking/kitchen endeavors! 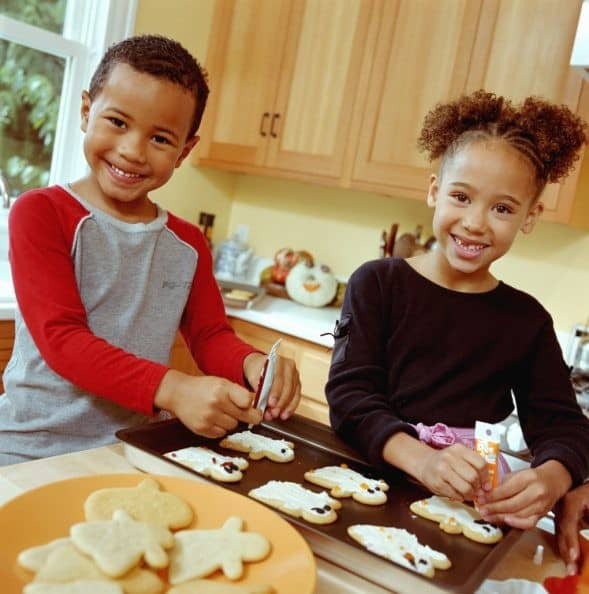 Invite your children to be creative and make food for the family before school year routine kicks in. You are teaching them a critical mental and physical underpinning of a happy life. It takes time and patience but the payoff is a united, mindful family. Have fun eating and playing with your family!